KEEP YOUR GRILL GOLD CLEAN AND ENJOY THE MOST HASSLE-FREE BBQ! 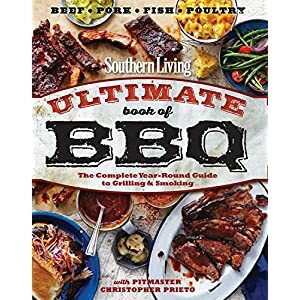 – Who doesn’t love BBQ’s? It’s the best way to spend your Sunday with your friends and loved ones! But grilling and barbecuing can prove really tricky if you don’t have the right grill accessories! 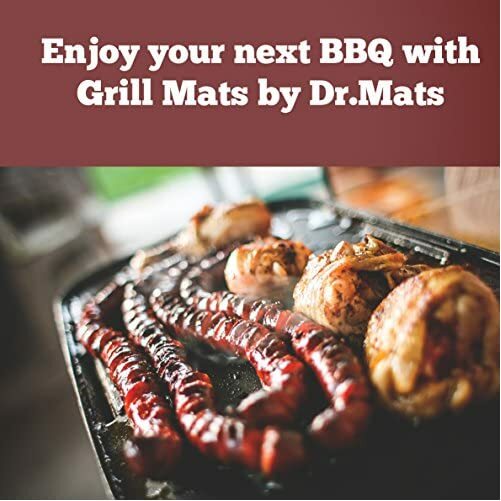 That’s why the Dr.Mats ultimate non-stick grill mat is here to make your life easier and your barbecues 100% hassle-free! 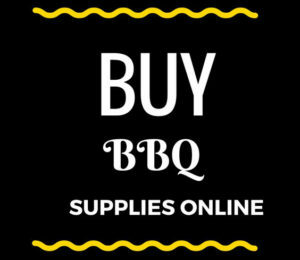 Throw Your Grill Brush Away And Get the best gas outdoor grills accessories for your Sunday Barbecue! STOP STRUGGLING WITH STUCK FOOD ON THE GRILL MAT! – Our heavy-duty grilling mat is made of 100% non-stick, BPA and PFOA-free PTFE (Teflon) material which is not only extremely durable, but also 100% food-grade! Plus, its thick design will make sure that your robust BBQ grill mat will last for longer than flimsier alternatives! THIS IS THE BEST BBQ GAS, COPPER, CHARCOAL ACCESSORY FOR YOUR GARDEN.! 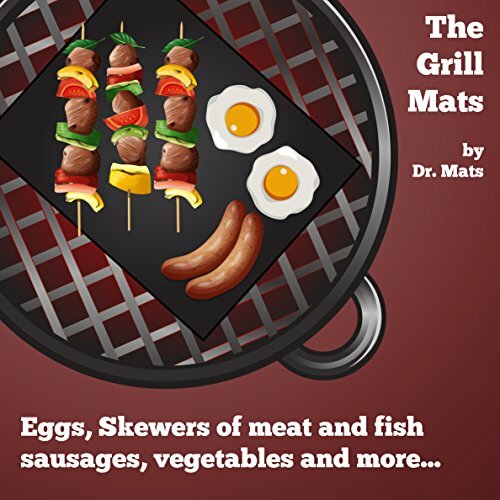 And Don’t Forget, Get Dr. Mats Grill Mats BBQ CookBook with 30 Delicious Recipes for FREE. !! 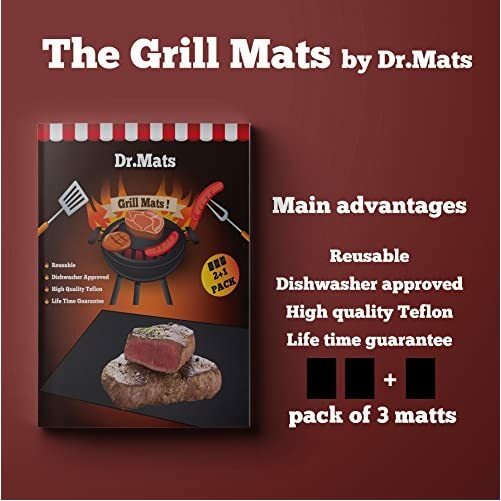 The Strongest Material For The Softest Burgers!-Made of 100% superior-quality PTFE (Teflon) material, theDr.Mats robust grill mat is not only durable but also 100% food grade and secure for both you and your food. The Dad-Approved Barbecue-Hack Every Mom Will Love!- our ergonomic BBQ mat is large enough (15.74″ x 13″) to cover the surface of your grill and thick enough to both gather and dissipate the heat, so your juicy burgers will be perfectly cooked! And you’ll be able to even slip it in the oven, since our sturdy PTFE material can easily endure temperatures up to 500°F (250°C) without skipping a beat! even a Panini press liner! Don’t Hesitate!- 100% satisfaction guaranteed. Dr.Mats has been your trusted source of kitchen, barbecue and grill accessories for years!By choosing the Dr.Mats grill mat you’ll be able to receive a wonderful eBook with mouthwatering BBQ recipes you must definitely try and easy, simple instructions on how to use and clean your ergonomic, non-stick grilling mat! KEEP YOUR GRILL GOLD CLEAN AND ENJOY THE MOST HASSLE-FREE BBQ! 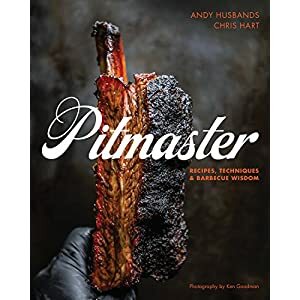 – Who doesn’t love BBQ’s? It’s the best way to spend your Sunday with your friends and loved ones! But grilling and barbecuing can prove actually tricky if you don’t have the right grill accessories! 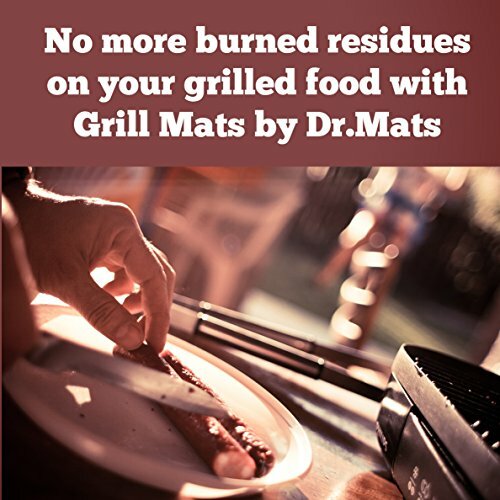 That’s why the Dr.Mats ultimate non-stick grill mat is here to make your life easier and your barbecues 100% hassle-free! Throw Your Grill Brush Away And Get the best gas outdoor grills accessories for your Sunday Barbecue! STOP STRUGGLING WITH STUCK FOOD ON THE GRILL MAT! 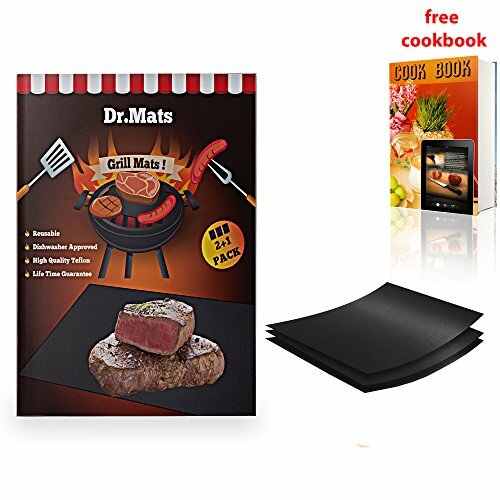 – Our heavy-duty grilling mat is made of 100% non-stick, BPA and PFOA-free PTFE (Teflon) material which is not only extremely durable, but also 100% food-grade! Plus, its thick design will make sure that your robust BBQ grill mat will last for longer than flimsier alternatives! THIS IS THE BEST BBQ GAS, COPPER, CHARCOAL ACCESSORY FOR YOUR GARDEN.! 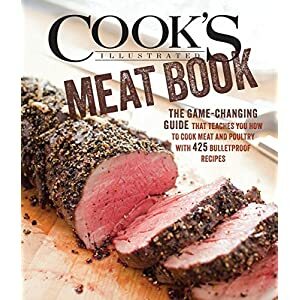 And Don’t Disregard, Get Dr. Mats Grill Mats BBQ CookBook with 30 Delicious Recipes for FREE. !! 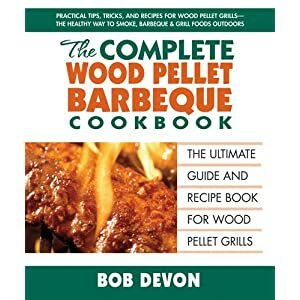 BECOME THE GRILL MASTER EFFORTLESSLY WITH THE BEST GAS AND CHARCOAL GRILL ACCESSORY! 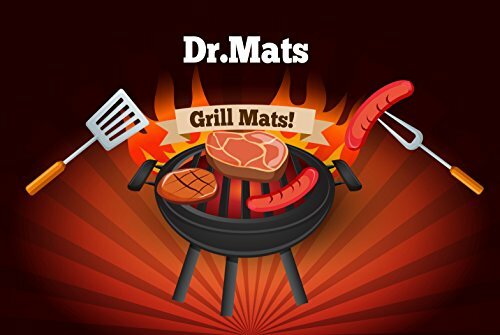 – Not only is the Dr.Mats elite grill and BBQ mat healthier than grilling directly on the grill, but it’s also compatible with all charcoal, electric or gas grills! Plus, you’ll be able to even use it for baking in the oven, since it’s heat resistant up to 500°F (260°C)! And once you’re done just slip it in the dishwasher and you’re good to go! 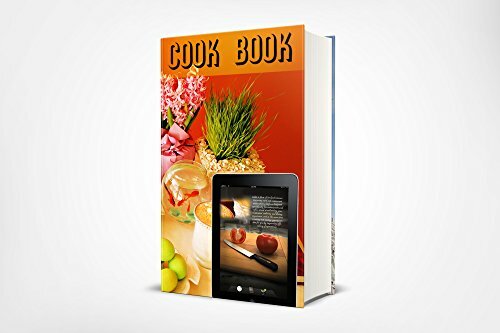 Get A User Manual At Purchase to use with perfection.